I have a 1.5 tb seagate external hard drive that went RAW on me and I ran a scan with TestDisk and it came up with no partitions (see attachment). What should I do? Would it be possible to upload another screen from Analyse (current partition structur). It's your partition table and necessary to exclude that anything is wrong. If your partition is OK and appears as RAW so it looks like that either your boot sector or file system is damaged. Hmm...is this what you wanted? The last time I went to disk management it just showed one partition and that the disk was RAW, now it came up with this option box and I don't want to lose anything... Thanks so much! Requested photo has been from TestDisk and Analyse. 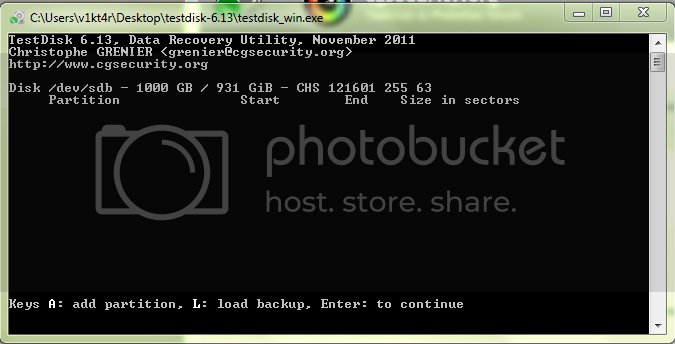 But your Photo from your disk management console is even better. Because you have no partition at all. Your space is unallocated and not initialized. The first thing to do would be to initialize your disk using your disk management console. Windows writes a 4 byte signatur to your MBR. Then windows can handle your disk and Testdisk also, because TestDisk gets the infos from your windows. In TestDisk, confirm at create a log, select your affected disk, choose partition table type Intel (if not already predefined), confirm at Analyse with Enter and upload a screen. I would need another Screen from Quick Search and if no partition is found from Deep Search also. If a partition is found, please mark it and press p to list your files. Please let me know, did you see your files or an error message. OK, I tried to initialize it and it came up with this error. Thanks. Is there anything I can do with this or do I have to bring it to a professional? I have a lot of stuff that I really want to get back - is that going to be possible? Thanks. Would it be possible to use Crystal Disk Info? Also a test using the diagnose tool from the manufacturer could help. OK, I'll try that. Thanks so much! Please let me know the status of your disk. Also if you get your disk initialized to have a diagnose to recover data. I have the exact issue as above, test disk shows no partition, I went to disk mgt as u had suggested to the user above and the drive doesn't show.